Extreame Savings Item! Save 50% on the Promo Heat 15 in. x 15 in. Sublimation Heat Transfer Press Machine Clamshell - Black by Promo Heat at Vains Faktory. MPN: FBA_PRESS-CS-15. Hurry! Limited time offer. Offer valid only while supplies last. Versatile operation - Large (15'' x 15'') element allows transfers onto many flat surfaced items, such as fabric, metal, wood, ceramic and glass. Versatile operation - Large (15" x 15") element allows transfers onto many flat surfaced items, such as fabric, metal, wood, ceramic and glass. Create your own custom t-shirts, mouse pads, tote-bags, license plates, and many other unique and fun items. Easy to use - Arrives fully assembled and ready to use (printer and paper not included). Clamshell configuration - Space saving design. Digital LCD timer - Preset desired time and an audible alarm will sound when time is complete; helps avoid over exposure. Digital LCD temperature control - Set the desired temperature (in Fahrenheit) and element will stop heating when preset temperature is reached. Temperature caps at 480 degrees Fahrenheit. Parallel arm handle with ergonomic foam-grip - Minimizes handle flex when opening and closing the machine, unlike some single-arm machines that tend to twist and torque. Comfortable for everyday-use and long production runs. 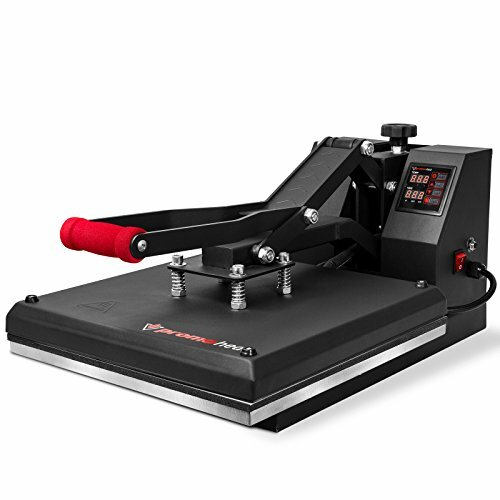 Adjustable multi-spring balancer - Handle applies closing pressure through a spring and pressure-plate system, which allows pressure to be more evenly distributed across the entire platen when clamshell is closed. Teflon-coated element - Unlike other machines with bare-metal heating elements, the element on this machine is teflon coated. The surface is non-stick, preventing scorching of transfers, and does not require a separate silicone/teflon sheet.